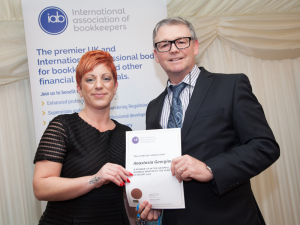 The International Association of Bookkeepers held their annual UK & International Business & Skills Awards in the House of Commons on Thursday 7 December. The winners were honoured during a prestigious drinks reception ceremony celebrating the achievements of a host of highly accomplished IAB members and industry professionals. SFEDI Group and IOEE were proud to sponsor the IAB Small Business Mentor of the Year Award, which was won by Kris McCulloch MIAB. We were delighted that Anastasia Georgiou, a Manager with Lloyds Banking Group and a committed IOEE Mentor, was announced as the runner-up for this award. Vivienne Burrows Award for Longstanding Commitment to the IAB awarded to Beryl Shepherd FIAB. SFEDI and IOEE would like to congratulate all the award winners and runners-up.